Written in the summer of 1860, the letter is addressed to William Jones, an early employer of Lincoln’s in Indiana. Jones went on to serve in the Union Army despite being well advanced in years, losing his life at Atlanta in 1864. This document is not included in the Collected Works of Abraham Lincoln, although a few others with the same date made it into the collection. Dr. Charles Hubbard, Director of LMU’s Abraham Lincoln Institute for the Study of Leadership and Public Policy, will preside over the symposium. For more information, call 1-800-325-0900 ext. 6439 or (423) 869-6439. DVD copies of Steven Spielberg’s Lincoln will be going out to public and private schools as part of an educational outreach effort; some schools will also receive new electronic equipment. Click here for more info. The historic concert will celebrate the February 12 release of Rural Rhythm Records’ “God Didn’t Choose Sides: Civil War True Stories about Real People” album that coincides with the anniversary of Abraham Lincoln’s birth. The concert and CD features some of today’s top artists including: Steve Gulley, Dale Ann Bradley, Marty Raybon, Carrie Hassler, Brad Gulley, Tim Stafford, Rickey Wasson, Dwight McCall, Dave Adkins, and the Gap Creek Quartet. Supporting musicians include: Sierra Hull (mandolin), Jason Burleson (banjo), Brandon Godman (fiddle), Phil Leadbetter (dobro), Bryan Turner (bass) and Debbie Gulley (vocals). Mark “Brink” Brinkman will also provide a special songwriter segment. The proceeds from the concert will benefit the ALLM and help fund a documentary on the project that is currently under development. Doors open at 6:30 p.m. and the show will begin at 7 p.m. Two ticket options are available. A VIP experience includes a reception at the LMU President’s House before the concert, a copy of the CD, VIP seats at the show and a meet and greet with the musicians after the show. VIP tickets are available for $100. General admission tickets are $35. Tickets can be purchased online here. 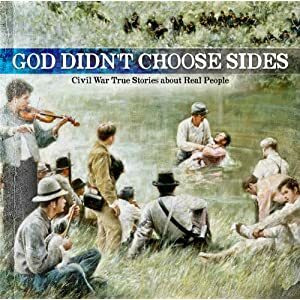 The album, “God Didn’t Choose Sides: Civil War True Stories about Real People,” includes 12 original songs inspired by journals, stories and artifacts from soldiers, civilians and politicians during the Civil War. Also included on the recording is the traditional song “There is a Fountain” performed by the Gap Creek Quartet. It’s a collection of songs that focus on the common men and women who were thrown together into the realities and horrors of war; people who displayed amazing acts of kindness, selflessness, faith, love and brotherhood. All but one track, “Legend of Jennie Wade,” on the album were recorded, at least in part, at Steve Gulley’s The Curve Studio in Cumberland Gap, Tenn.